Lush and serene, with a show-stealing pool to rival the beach, Elements of Byron adds a little more barefoot luxury to the bay. I am doing squat jumps on the beach – sand between my toes, salty sweat on my brow – when I am surprised by the most unlikely of visitors. The scenario is already pretty unlikely. I rarely take exercise on holiday with me, and I have never been a morning person, but there’s something about staying just metres from Byron Bay’s Belongil Beach that lures me to sweat with the sunrise. My guest is of the equine variety; an absolute beauty, she takes my mind off my burning quadriceps. It is a magic moment, the kind that staff at Elements of Byron strives to create. The beast trots past, the rider is an instructor, in fact; beach horse riding is just one of the activities on offer. Elements of Byron signature one bedroom Villa in the Wetland Theme. 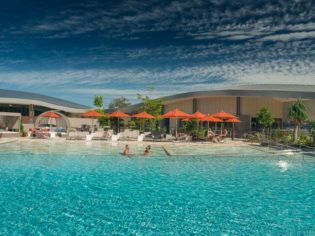 Six years in the making, Elements of Byron is a $100 million beachfront resort located just north of the Byron Bay township. The retreat opened in February 2016 and has been lauded for its design, eco values and luxury appeal. 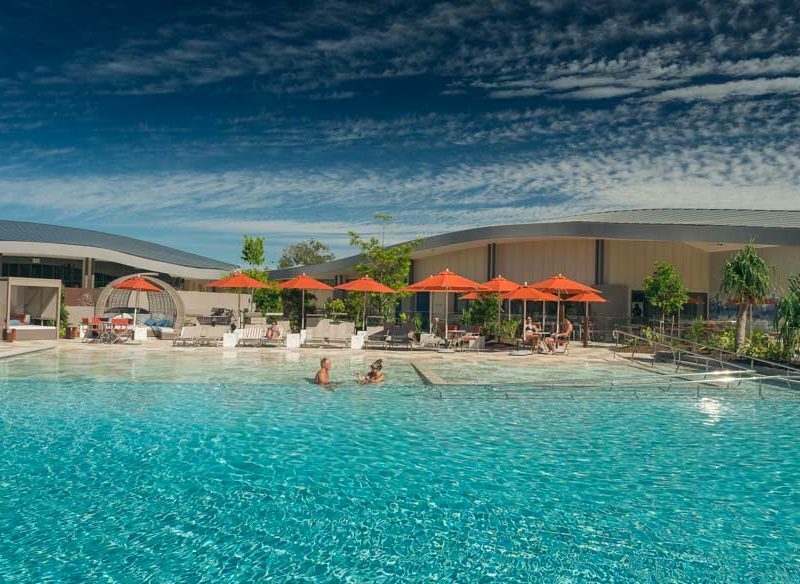 The award-winning design is immediately apparent in the main pavilion: relaxed and open, the outdoors are invited in, while blown glasswork and a striking huge copper sculpture hang overhead. With the vegetation in its infancy, the short trip from the pavilion to our room is underwhelming and a friend comments that it feels like school camp. It should be noted that the site has been replenished with more than 65,000 native trees and plants – an impressive effort. Still, I look forward to returning when the greenery is lush, just like the rest of the resort. Speaking of lush, Elements boasts 103 private villas dotted across 22 hectares and ours is a serene space that begs to be lounged in. Crisp white bed linens, blond wood and textural touches in shades of green help complement the natural environment; an effort that is mimicked throughout the resort. The jewel in Elements’ crown, though, is the lagoon pool. Surrounded by bures, settees and hanging lounges, it accommodates all pool-going types and led me to reject the beachside lounges altogether. Early evening sets over Elements of Byron. Indeed, Elements makes it hard to find an excuse to set foot outside its confines. But while Graze restaurant is good – I enjoyed the continental breakfast included with the room rate, and the ‘Byron’ ceviche of snapper and prawn is exceptional – one dinner visit was enough; the Byron hinterland has plenty of essential places to dine. As for Osprey Spa, I’ll call more than a week in advance next time to avoid disappointment. Elements of Byron wasn’t on my radar, but my go-to haunt was booked out. And while I was reluctant to find an alternative, thankfully it proved to be a more than worthy challenger. Verdict: Great for a little barefoot luxury. We rated: That pool. We could hang out there all day – and we did. We’d change: The absence of a shuttle service to town. It’s not a huge trip, but just one morning and one late afternoon option would be a handy addition. Notes: We paid $410 per night for a Botanica Villa.